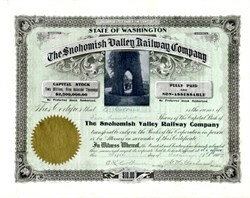 Beautifully engraved certificate #18 from the Snohomish Valley Railway Company issued in 1907. This historic document was printed by the Lowman & Hanford Stationery & Printing Company and has an ornate border around it with a vignette of people walking through a tunnel cut in a sequoia tree. This item is hand signed by the Company's President ( George M. Cochran ) and Secretary ( E. Colburn )and is over 97 years old. The certificate is issued to E. Colburn for 500 shares. This is the first time we have had a stock certificate from this company although we have had several bonds. 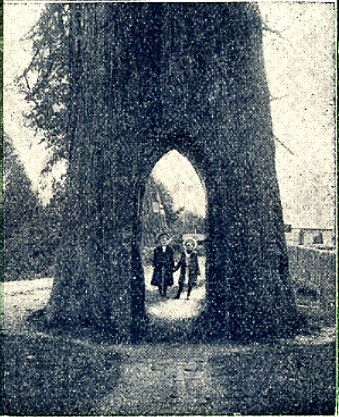 The walk through tree was hollowed for the Snohomish Bicycle Club in the late 1890s. It was located about two miles south of the town of Snohomish WA. It fell in 1928 and another nearby tree was hollowed in the same manner. The replacement tree stood until vandals set it on fire in the late 1990s.